Asafa Powell clocked two more impressive times this afternoon (7) cruising to 9.77 in his heat of the 100m and then produced his second show of the day by winning the final in 9.82, on the Rieti track where he set his last World record in 2007 (9.74); all this just two days after his clash against Usain Bolt in Brussels (Fri 5). 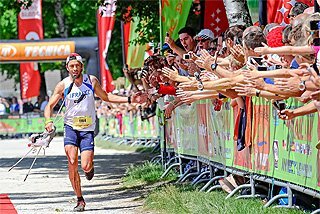 Powell’s runs were the highlights of a high quality Rieti Grand Prix, which is a meeting as part of the IAAF World Athletics Tour 2008. 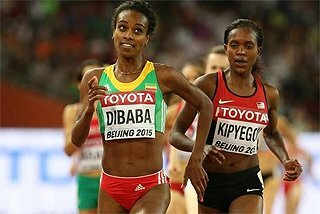 The other top memories from a great afternoon and early evening of athletics were provided by: Tirunesh Dibaba, the 5000 and 10,000m Olympic champion, who had to run alone for most of the 5000m crossing in 14:23.46; Tatyana Lebedeva who set a new meeting record in the Triple Jump with 14.94m; Gelete Burka who ran a new African record and world seasonal best in the women’s Mile, 4:18.23. 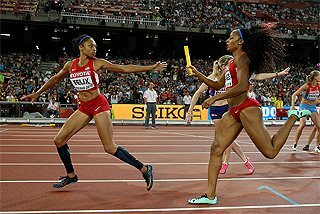 Powell set the meeting off to a very fast start clocking a superb 9.77 (+0.9m/s wind) in the first 100m heat leaving the impression that something special was in the air for the final in the Raul Guidobaldi Stadium. 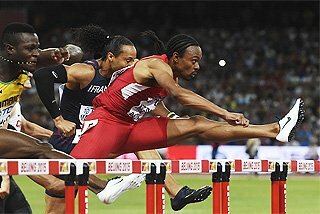 Powell’s training partner Michael Frater, Olympic finalist in the 100m, took the victory in the second heat in 10.12 holding off US sprinter Travis Padgett (10.17). 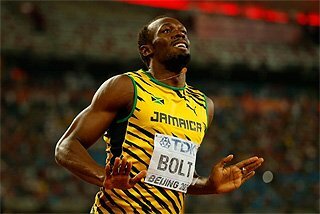 Powell felt nervous at the start of the final, making a false start. At the second time of asking his reaction time was slow (0.195) but he produced a suberb show in the second 50 metres cruising to 9.82 (tailwind 1.4 m/s). Frater dipped under the 10 seconds barrier finishing second in 9.98 coming close to his PB by just one hundredth of a second. Tirunesh Dibaba made an attempt to break her own World record for 5000m which she had set in Oslo’s Golden League meeting in June (14.11.15). Dibaba was paced by Russian Anna Alminova in the first part of the race, passing 1km in 2:49.44, one second slower than the pace set in Oslo (2:48.08). Alminova finished her task earlier than planned before the 2km mark, and Dibaba ran alone in the final 3km but was still inside the Oslo’s record at 3km (8:38.42) but the rhythm faded in the final 2km. She was 8 seconds outside the required pace at 4km (11:36.67) and at this point any hopes of celebrating the eighth world record in the 38-year-old Rieti meeting vanished. Dibaba finished in 14:23.46. 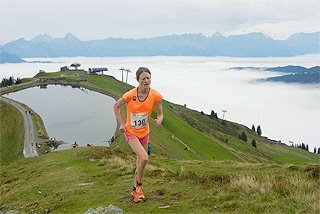 It must be said that experienced pacemaker Olga Komyagina did not feel well and could not take up her pace making task for Dibaba during the race. 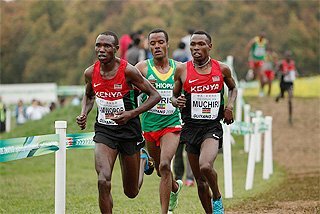 But Kenyan Edwin Soi is gearing up to be in top shape for Stuttgart where last year he won both the 3000 and 5000m, and today he set the world seasonal best in the men’s 3000 metres running in 7:31.83 so improving his PB by one hundredth of a second. Russia's Tatyana Lebedeva set a new Triple Jump meeting record leaping to 14.94m in an exceptionally close re-match against double Olympic champion Francoise Mbango from the Cameroon who finished third with 14.90. Russian Anna Pyatykh came dangerously close to Lebedeva’s leading mark in the fourth and final attempts leaping to a best of 14.91m. Shelly-Ann Fraser, the Olympic 100m champion in Beijing, continued her successful post-Olympic campaign by clinching the women’s 100 metres in 11.06, edging out Olympic silver medallist Kerron Stewart, second in 11.11 and last year’s World championships bronze medallist Carmelita Jeter (11.13). Olympic 400 metres silver Shericka Williams continued the good day for Jamaican sprinters notching up the 200 metres win in 22.50 beating US sprinter Carmelita Jeter, who finished second in 22.52 in a very close race. USA's Chauntie Howard cleared 2.00 metres on her second attempt to beat Marina Aitova (1.97) in the women’s High Jump. 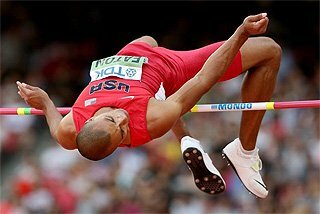 Howard, the World silver medallist in Helsinki 2005, made three unsuccessful attempts at 2.03. Aitova from Kazakistan was in the lead after clearing 1.97 in her first attempt but could not succeed in going over 2 metres. 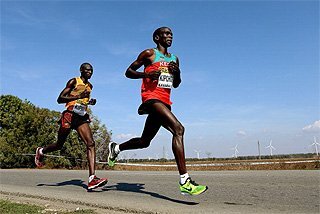 Bernard Lagat, World champion in the 1500 and 5000 metres, made up somewhat for his disappointing Olympic Games with a good performance in the men’s 1500 metres, running 3:32.75, setting a new seasonal best on a track where he broke the US record with 3:29.30 in 2005. 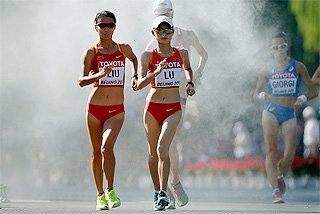 The women’s Mile which featured Bahrain’s World 1500m champion Maryam Yusuf Jamal and Olympic silver and bronze medallists Iryna Lishchynska and Nataliya Tobias was billed as a World record attempt. Tina Paulino took charge setting the pace in the first 800m passing the 400m mark in 1:05.01 inside the World record pace of Zurich 1996 when Svetlana Masterkova ran 4:12.56. Sonia Roman went through the 800m in 2:05.18, and Jamal was in the lead at 1200 metres (3:18.08), and remained there until 1500m (4:01.48) as when Ethiopian Gelete Burka passed her and they engaged in a close battle to the line. The World indoor bronze medallist prevailed in the final metres clocking a new African and meeting record with 4:18.23 to Jamal’s 4:18.50. World junior record holder Ruth Nyangau Bisibori won unopposed in the women’s 3000 Steeplechase in 9:21.30. Poland’s Wioletta Frankiewicz finished runner-up in 9:28.07. The men’s 800m provided a spectacular race between the Olympic gold and bronze medallists Wilfred Bungei and Alfred Kirwa Yego. Pacemaker Sammy Tangui set the pace in the first lap clocking 51.35 before finishing his task at 600 metres (1:18.06), after which Bungei and Yego engaged a great battle in the final straight. Last year’s World champion Yego prevailed over Bungei with a very strong finish, clocking 1:44.69 to Bungei’s 1:45.01. Justus Kiprono Koech took the men’s 800m B race with 1:45.02. 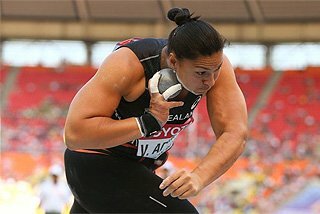 Cuban Yipsi Moreno, Olympic silver medallist, won a high-quality women’s Hammer Throw with 74.71m. The winning throw came in the third attempt after she had two fouls in the first two rounds, and Moreno produced a second best throw of 73.51 in the fourth round. Darya Pchelnik from Belarus finished second with 71.51m ahead of Pole Anita Wlodarczyk, third with 71.41. 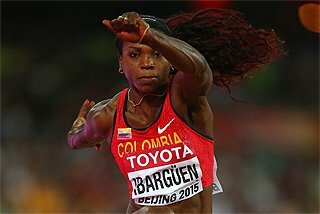 The fourth thrower able to break the 70 metres barrier was France’s Manuela Montebrun with 70.70. Louis Van Zyl from South Africa clinched the men’s 400m Hurdles in 48.52 sec winning with a solid margin over Jamaican Isa Phillips (48.85), while Jamaican Olympic champion Melaine Walker won the women’s race in 55.05 but it was hard-fought until the final hurdle as Briton Tasha Danvers, the Olympic bronze medallist, came close to a surprising win, finishing second in 55.25. Gary Kikaya from Congo, African 400m record holder (44.10sec), showed a return to his best form with a 45.10 run ahead of Olympic finalists Martyn Rooney from Great Britain (45.52) and Johan Wissman (45.62) from Sweden. Brian Dzingai from Zimbabwe won the 200 metres, the final track race of the meeting, in 20.34sec ahead of Stephane Buckland (20.40) and Brendan Christian from Antigua and Barbuda (20.49). Miguel Pate scored his second consecutive win in the men’s Long Jump following his victory in Brussels (5 Sep) with a 8.21m leap in the fourth attempt after three fouls in the first three rounds. Olympic finalist Ndiss Kaba Badji from Senegal led until the third with 8.03 increasing his best to 8.13 in the fourth. Local favourite Andrew Howe fouled his first three opening attempts but jumped over 8 metres in the fourth round to finish fourth with 8.01. Luis Felipe Méliz of Spain was third with 8.12m. Sergey Kucheryanu from Russia cleared 5.60 in his second attempt to win the men’s Pole Vault before failing three attempts at 5.70.